Joe: There’s so much great advice here. I’m sure you’re going to love it. Yes, Haryana, I’ve noticed on Twitter that you went to the ANZUP Pedalthon, what was that experience like? Haryana: It was great. I went last year but I didn’t ride. This was the first time I had been riding because I’ve had now two grants from the below the belt Pedalthon, so I went last year and was just a part of a panel discussion. This year was great because we got out early and did the ride, I had all of the teammates that I had, so we were on the ANZUP dream team. We had all been funded by the below the belt money. It was just really nice to be part of that. It was a great feeling because there were more than 250 riders. I’m not the fastest rider, so it was pretty impressive when the lead pack went fast. They were very speedy, and it was tight all the way through. Until the very end. It was good. Great fun to be a part of it. Joe: Yes, that’s fantastic. What a great turnout, as well. Haryana: Yes. It was. Good fundraising and I think part of it, I think it was just really nice, we did another panel discussion at the end over lunch, it was just really nice to be able to demonstrate what we do with the funding and how we use it. We had two people who were looking, one person who was looking at bio markets for new ways of delivering treatments for prostate cancer. Someone else who was ways of trying to identify how people are responding early on. Of course, the project that I was doing about the patient experience and the patient reported outcome measures, so trying to incorporate those into clinical practice, so we could pick up earlier what their symptoms are. Being able to explain to people that’s what we do, and the trials groups is not just about new treatments, but it’s about the whole experience and just trying to help people to be able to live longer, but also live with less symptoms and with a better quality of life, as well. Joe: Yes, that’s fantastic. Haryana, tell me about the project that you’re going to be working on, about the symptoms, what’s that all about? Haryana: There’s been a lot of interest over the last few, well, quite a long time, actually, about trying to incorporate quality of life measures and patient reported outcomes into clinical practice. It’s been a bit challenging to do that because the measures that we used to need to be scored and then it’s not really quite clear how you might best deliver that information back to the clinicians to make it easy for them, to incorporate that. A few years ago, there was a principle study where a team in the U.S. had done this, they actually demonstrated by incorporating patient reported outcomes into routine practice, they increased the survival of the patients in the study, as well. It seemed that if we were looking after people better and being more responsive to their symptoms and side effects to the treatment, then we were helping them to live longer, as well. What we’re trying to do it, take an app that one of my nursing colleagues from Queensland, Natasha Roberts, has developed, to make that available to patients with GU cancers and to get them to rate their symptoms once or twice a week whilst they’re going through treatment and when they’re on treatment breaks. Then we can look to see whether we’re picking up additional information and symptoms that the clinicians aren’t picking up when they’re back in the clinic. To see whether or not the patients will actually use the app and fill that out, there’s a lot of discussion about whether people who have cancer have got sufficient digital skills and willingness to actually engage in filling out. We’re using smartphones or tablets to do the questionnaires. We’re looking at whether it’s feasible for them to do that and then what we learned from that in terms of the symptoms and how we might use that information back in clinical practice. 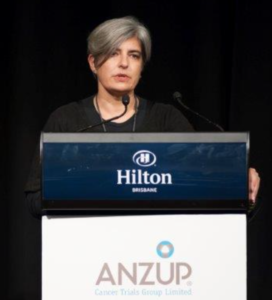 Ideally, what we’d like to do is to be able to use this type of information as a routine in all of ANZUP’s trials in the future, so we can be a bit more responsive to patients and their symptoms, but also to use it to try to be incorporated into clinical practice. Joe: Yes, that’s really cool, Haryana. You know, it instantly makes me think that it’s something that might even help people on the level of just being listened to, you know? Haryana: Yes, well, I think that’s one of the things that’s really challenging, the time that patients and families have with their healthcare professionals who are looking after them are sometimes quite limited. They may sense that some of the information that they told to their clinicians because they don’t think there’s time to talk about it. This may be a way of helping us to overcome that and to actually use those patient reported symptoms to better direct the conversations that clinicians and patients have when they’re together, to make sure that they’re actually addressing the most important needs that people have at that particular time. That they might not have otherwise talked about. Joe: Yes, that makes so much sense, Haryana. I know that’s a huge part of clinical trials, is getting a lot of feedback. I know that’s something that you’re really passionate about. Tell me, with respect to doing clinical trials, what are, in your opinion, some of the biggest myths and misconceptions that people have about going through a clinical trial? Haryana: I think really one of the biggest misconceptions is that clinical trials are only offered at the end of life, or when all other treatments options have been exhausted. That’s really a big problem for us to try to overcome. We want people to understand that we have trials right through from prevention of cancer to surgical procedures and supported care, as well as all of the other treatments that might be relevant to someone. The critical thing about it is that this is actually a really good way that you can ensure that you’re getting the best supportive care, or the best treatment options. When we do particularly randomized clinical trials, we’re comparing and new or a different sort of treatment that we think might be better than the standard treatment to what might be considered the best standard care. That standard of care is agreed on by all of the clinicians who take part in the study in the group and who are members of the group. You can be certain that you’re getting the best treatments that you would be offered outside of the clinical trial, as well. Plus, the fact that you also often have slightly more frequent monitoring visits and follow-up because we wanted to see and track how you are performing or how the trials are going, the treatments that we’re looking at and how the trials are going. You have regular contact with your clinician and the research team that help to support them in the hospital, as well. You get a bit team as part of your care, in addition to the cancer doctors who would normally be looking after you. They’re two kinds of things that are important to understand. I guess the other thing is that there are lots of headlines and news about miracle breakthroughs and cures for cancers and things like that that we see, often, they’re headlines that are based on headlines before we’ve even tried some of these treatments in people. Actually, the time that it takes for us to do a clinical trial and demonstrate the impact on the cancer developmental growth and then even later on, people’s long-term survival outcomes are things that usually take years for us to be able to do. Sometimes we may not have the answer to from a clinical trial or three or five or ten or even fifteen years after it starts. It’s a really long-term investment on the part of the clinicians and the health professionals and the patients, as well, in terms of making sure that we get all of that relevant data. Joe: Haryana, that makes so much sense. Do you know what? It also makes me think about making decisions, whether deciding whether the clinical trial is the right way for you, or just deciding that you’re in different types of treatment. It’s such a critical time for any patient when you have to make choices about things that you don’t necessarily understand. What advice do you have on that front? Haryana: I think the really important thing is to try and think about the questions that you have and what’s important for you. It’s really valuable when you’re talking to the health professionals that will help you make these decisions and to walk you through that information. That you understand the things that are important to you. Is it really important to you that you don’t have to come back to the hospital very often? Or is it important that you don’t need to disrupt your working environment or that you can continue to drive as you normally would, all of those sorts of things. The things that are valuable to your lifestyle and your way of living. Try and be as clear as you can about that. Also, then to think about the questions that you might have about the treatments and what those options are. There are some really useful tools that you might like to look up. There are a series of question prompt lists for cancer patients who are talking to their surgeon or to a medical or radiation oncologist, as well as some form of palliative care. These little brochures which are available from the Cancer Institute of New South Wales website, are called question prompt lists and you can download those. They’re just an A4 sheet, so they’re divided across some panels. They have a whole series of questions which might just prompt you to think about things differently. You can go along and tick off the questions that you might have that you would like to ask your clinicians. It just can help you remember that you need to ask when you’re going into those consultations, because once they get started, it can be really challenging to remember the things that you wanted to ask about and say that it’s quite helpful to have those sorts of questions there. What that can also do is really focus the conversation that you’re having with your doctor on the things that are really important to you. Sometimes they have a tendency to run off their spiel about different treatments and what the options are. That can take up a little bit of the conversation time, but if you can use your questions to direct them to the areas that you’re most interested in knowing about, then I think that can actually be really useful for you and for them, as well. Joe: Yes, that’s such a great, point, Haryana. It also gives you an opportunity to write down answers, because one thing I know from personal experience is that quite often the minute you walk out of a specialist appointment, you have no idea what just happened. Joe: You have nothing to refer back to, right? Haryana: Yes. I think that’s another really interesting point. Taking notes, having someone else with you who might take notes, as well, is really important and can be quite helpful. The other thing that you could consider doing is asking if they’re comfortable with you audio recording the consultation. There was some work that was done in Australia, maybe about 15 years ago now, but it really showed that audio recording those conversations was helpful for patients and it helped them to actually retain information and they could share that with their family and their friends if they wished to, or their general practitioner, to talk through it. It was a way of providing information directly from the doctor in that way, explaining it in that and allowing them to review it multiple times if they wanted to and have it as a reference. That was actually really useful for patients. It meant that they spent less time calling their doctors and the hospital back trying to clarify things, as well. I would really encourage people to start asking their clinicians to do that and see how that goes with them. Joe: Yes, thanks, Haryana. That’s such a great point because it’s also so easy to do, right, because we all have, even with our mobile phone with us, you can just turn on the recording and you can just listen back to it later. Yes, check out any information that you might have missed, or then follow-up with actual specific targeted questions, as well. Haryana: Yes, absolutely. I think it’s really helpful for all of those things. Joe: Cool. There’s a lot of waiting and uncertainty that comes with cancer because you’re constantly needing tests, results, visits to the hospital or the specialist. What do you think are some of the ways to deal with waiting, with this constant waiting for things to happen? Haryana: I guess this is really getting to the point where you’re feeling sometimes a little bit out of control and that things you don’t have a lot of say in, when some of these things happen and how long you do have to weight. I think there probably are some strategies that are helpful. Actually, the first one, I’d say, is when you’re talking decisions about treatment in particular, while you might feel that you want to make a decision and get moving quite quickly, often there is time to really take a little bit of time to think a little and research what it is that you would like and then really consult with your general practitioner and your family and friends about talking about any concerns that you might have. 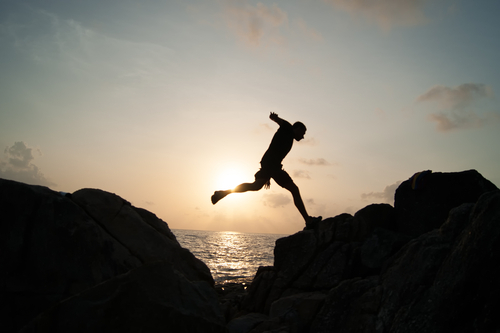 I think in those initial stages or even when you’re training treatments during the whole journey, then there is time to make some of these decisions. They don’t have to be made on the spot. Feeling like you can take that time is important. The other things, in terms of coping with the waiting time, that’s a really big challenge. I think there are definitely some ways to do that. One, I think is, working out what it is that you do to cope normally before your cancer experience. How do you cope with uncertainty and things because we all have that in our lives and what are the strategies that you do? Did you really find them helpful? For some people, it may be that they engage in some either moderate or more vigorous physical activity. They might run or swim or go for bike rides. Other people, it might be something that is more like yoga or tai-chi, those kinds of activities that can just really help you to expend some of that energy and take you outside of your own head, if you like, and really focus you on doing something else new completely. That can be really helpful. Plus, that feeling that you have after you’ve exercised, so those endorphins can also be really helpful in helping you to manage your mood and things like that. For some people, meditation is very helpful. I think that’s potentially a very useful tool for people to be engaging in. Others, it might be just being able to share that experience with other people and to talk about the fact that you might be feeling anxious and you might be feeling a bit worried and uncertain about things. I guess trying to plan times around that where you might make sure that in the lead up to another CT scan or in between waiting for the results that you don’t plan to do anything that is going to add to your stress levels at that time, if it possible. Maybe you don’t plan big meetings or large family events, if you can avoid then when you’re probably not feeling like being around lots of people in an intense situation. They are some of the practical things that you can do. Sometimes just having someone else to talk to about these things. Either a Councillor or a psychologist or pairing up with another person who is having a similar experience or has been through that, so another patient or cancer survivor, who really understands what it’s like to be sitting with that uncertainty and to be quite helpful. That’s one of the things that people describe a lot, is that people who’ve not had a direct personal experience of cancer find it very challenging to find what it’s like for patients. Joe: That’s great advice. I really like the point that you made about going back to what worked for you before in a time of stress and uncertainty. I think most of us just look up and go, this is such a radically new experience that you don’t think of, well, what actually works for me? What can help me to deal with it that I’ve already done before. I think that was a great point. Haryana: Yes, because we all come to different life experience and including that cancer experience with a whole lot of skills that we already have and that we use. I think sometimes it’s easy to forget that you’ve got those. Joe: Yes, and with a whole lot of baggage, as well. Haryana: That’s true, too, yes. Joe: Haryana, I know you’ve done a lot of work around sleep and how that affects people both during treatment and beyond. What can someone do to sleep better as they’re going through cancer? Haryana: Yes, I guess this is something that’s always useful to reflect if you’re starting to have sleep problems, or you’re feeling that’s an issue for you. That reflecting on what your sleep was like before the cancer, as well. There are a lot of people in the general community who have very disturbed sleep. This may be something that is a much more glaring problem for you and the cancer has just kicked it off again, if you like. I think understanding that is really helpful. If it does seem to be something that is related, that has really started to emerge just around the cancer diagnosis or during the treatment, then there are some things that can be quite helpful. The main approach for managing significant sleep disturbances, that’s known to be effective, is actually cognitive behaviour therapy. This is really training you to rethink and reframe the way that you manage your sleep patterns and your expectations around that. It can actually help you to change your sleep quite substantially. Part of that is actually what we call sleep hygiene. We talk about this idea of healthy and unhealthy, or unhygienic sleep. The unhygienic sleep would be sorts of behaviours that people can sometimes get caught up in, using alcohol to moderate their sleep patterns to help them get to sleep. That probably means that they’re going to be waking up during the night and using tobacco or eating a lot before going to bed, those kinds of things. The expectation that you actually sleep for eight hours straight is a common perception in the community. We know that people have quite variable patterns around how long they sleep for at any given time. The expectations can be quite important. Once people start to get a little bit disturbed in their sleep, they can’t really describe it, they’re lying in bed for hours on end and watching the clock, sleeping in to make up for not falling asleep on time. Particularly, if they’re not waking up refreshed, those kinds of things. What’s really important is that we try and keep a fairly consistent pattern in sleep, so going to bed at a similar time. If you’re lying in bed and you’re just not going to sleep, then probably laying there and waiting for sleep to come is not the best thing. Giving yourself a time limit and saying, if I’m not asleep by this time, then I’ll get up and do something else. Probably make sure that’s not using your computer, television, or using your iPhone or something like that. The light from all of those things will continue to disturb you. I think it’s a matter of just planning that and seeing what you can do. Then if those problem persist, then actually going to see a clinical psychologist who can help you probably within two sessions to actually make some substantial changes in how you’re sleeping is. I guess the other thing that sometimes happens is, particularly during when you’re in hospital and having treatments, then the sleep does become disturbed because of the environment that you’re in, hospitals are not great places to sleep. Which is a little bit crazy, given that’s what most people need to do, but you’re often being woken up during the night and not getting it. Any of these sorts of things can start to put you into a poorer sleep pattern, that can then over time become compounded and you just end up with unhealthy sleep habits. That’s partly what we’re trying to change in the interventions. The other thing that we find is that sometimes the kinds of supportive care treatments that you might be taking while you’re going through chemotherapy and other treatments, might actually also impact on your sleep patterns. Sometimes they might make you feel very stimulated for a few days, so you don’t sleep very well, then those medications taper off after your treatment and you crash. 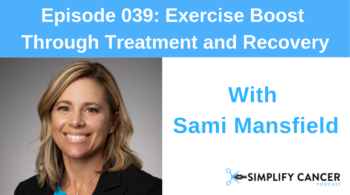 You’re going through this burn and bust cycle of energy levels that are really associated with the supportive care treatments that you might be taking. I think there are those aspect of it, as well, and maybe talking to – if you’re finding that’s the case – maybe talking to your treatment team about whether you need to take such high doses of some of these things or for some of the duration, it might actually help to manage some of those symptoms a little bit better, as well. The other thing I was going to say, is that lots of people think that it’s perfectly normal to have a sleep disturbance around the time of a cancer diagnosis and treatment, so they don’t tell anyone else. It’s probably important if this is what you’re experiencing, and it is worth talking to someone about it, so that they’re at least aware and can maybe think about some things to change. Joe: Yes, that’s a great point. I guess, also, we don’t think that maybe it is worse to go and see someone like a clinical psychologist, like you said, who’s a trained professional who can help guide you through some of those psychological and emotionally challenges that go hand-in-hand with cancer. In terms of this, this plays into this whole emotional and mental support that people have, do you think that people get the support that they need from their family and from their friends? Haryana: I think it’s incredibly variable. Like, in lots of things, people have different connections and different relationships. Some of those can be more or less supporting. Particularly when you may have had a specific role in your family, where you might be the person that does the supporting most and your family and friends may not be really sure how to support you because they’re not used to doing that. That’s not been their role in your relationship, so that can be quite challenging sometimes. Yes, as I said, I think it’s incredibly variable and there are many people who certainly describe their family and their friends don’t really understand what it’s like for them. They’re supportive and they’re helpful but actually, really understanding the fear that they’re living with, or the concerns that they have. It’s not quite the same thing that they find when they talk to other people who have had a cancer diagnosis and can really share that experience in a different way. Joe: That is so true, Haryana. It also makes me think of the partners and the caregivers who support people through cancer, because they’re quite often also get overlooked because the focus is on the person who’s going through cancer. It’s also incredibly difficult when you’re trying to maintain some semblance of a normal life, as well. What do you think? How can you find that balance between having the normal life you want and also supporting someone you care about through the crazy cancer adventure? Haryana: I think it’s a real challenge, particularly in those periods of acute treatment or for people who have advanced cancer. I think, again, it’s remembering that cancer is just one part of your life, it might be really big and an important part of your life, but it’s not everything. Trying to remember the relationships that you had and the connections and the things that you liked to do as either an individual or a couple or a family, then they’re the sorts of things that are worth trying to maintain some connection to those activities. I think for particularly caregivers and partners of patients, there’s a really big change because they do sometimes transition from being equal partners in a relationship, to being a person who’s caring for the other and being much more submissive and feeling responsible for the decision-making and maintaining their life and their lifestyle. That can be really challenging. I think recognising sometimes that that creates shifts and conflicts and maybe that there is a need for both the caregiver and the patient to engage in talking with a Councillor or a support person who is outside, who can give them some independent reflection on what’s happening and a space to talk about those things. Also, for the caregiver sometimes, to feel that it’s okay for them to talk to someone on your own, as well, to get the additional support that they might need, and talk about their own fears and experiences. They spend a lot of time and so, protecting the person that they’re caring for from their own worries and not wanting to burden them with that. Finding a way, whether it’s through a support group or a caregiver’s support group, be it Cancer Council’s helpline is a really good useful place to try and seek some of those, or access some of those resources because they’re really often telephone-based supports and that kind of thing. It can be quite helpful to do them and not contingent on them having to go to appointments, albeit, somewhere it, at particular times. Haryana: It’s such an untapped resource, it’s fantastic. The helpline… I’m just trying to remember it. I think it’s: 13-20-11, I think is the number. That’s Australia-wide. Basically, you go through to – your calls are answered by people who are trained. They’re usually counsellors or health people who have a health professional background. They can actually talk to you about what the needs are that you might be experiencing at the moment. To provide you some information about what’s possible. The initial phone call that you make is really about finding out what you need and then working out where to refer you. They don’t necessarily offer counselling support on the phone immediately, but it’s about planning who’s the best person for you to get access to in order to resolve those problems, or to have someone to talk to. They do telephone-base support groups and can connect you to face-to-face support groups. Cancer Council also has fantastic supports like a pro-gynae legal team who provide advice about creating wills and how you manage power of attorney and all of those kinds of things. As well as a pro-bono financial advisory group, as well. People who will come in to provide advice about having to renegotiate mortgages, to suspend mortgage payments while you’re going through treatment, also to negotiate access to superannuation or those kinds of things, that can be really helpful in relieving the stressors on both patients and their families during that critical period of time. Those are some of the things that they do. They also have a lot of online resources, so they can direct you towards those. Things like the podcast, that has recently been done, which is talking with a series of experts on different topics. It’s called: The Thing About Cancer. They’re really informative, 20 – 40-minute podcasts talking about different topics and issues. Interesting perspectives and really focused in great detail on a particular aspect of care. Because Cancer Council is also right across the country and it has offices in regional areas all over they country, they’re also very aware of what the local services are that are available that might support patients and caregivers. They can be really helpful in that sense. They do have some telephone-based counselling, as well, if that’s really what you need, then they can direct you toward that service, particularly if there isn’t something available in your cancer treatment centre and locally to you, as well. Joe: Yes, that sounds awesome. I wish I knew about it when I had to deal with it. Haryana, let’s just say you go through treatment and everything goes to plan and hopefully cancer is gone and you go through a follow-up regime where you go for check-ups. I think it’s something that every single cancer survivor has to deal with, is the whole fear of cancer coming back. What advice do you have on dealing with that? Haryana: That is a really big challenge. It’s a problem for many, many people. The critical question is, well, I think there are probably several things. One is, we can’t tell you that your cancer will never come back. I think that’s probably going to be the hardest thing to deal with. There are strategies that you can use to try and minimize the impact that that has. When, as psycho-oncology health professionals, we talk about the fear of cancer recurrence. We talk about it at different levels. The question is, is your fear of cancer recurrence becoming intrusive, does it make you worry? Is it on your mind all the time? 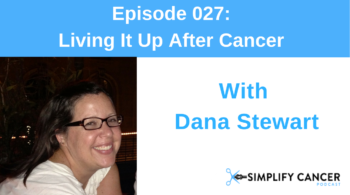 Is it stopping you doing things that you would otherwise do because you’re worrying about your cancer coming back? Does that make sense? Haryana: Yes, we talk about that as being a higher level of fear of cancer recurrence. We actually, within our psycho-oncology research group, which is a national clinical trials group, like some of the other groups, that we focus on psycho-social and psychological interventions. We did do a trial where we developed an intervention. It was delivered by clinical psychologists who were trained in this particular strategy about dealing with the fear of cancer recurrence. It did things like looked at what you thought about the cancer and how focused you were on worry, what you understood about your cancer and your prognosis and what the likely trajectory of that was. As well as mindfulness-based meditation to help you manage the worries that you might have. There were a whole range of strategies that were thought to people, as part of this intervention. What we did show was that it was very effective in reducing people’s fear of cancer recurrence and keeping that at a lower level over a six to twelve-month period. It was a five/six-week intervention that people did. It actually helped them to reduce their worry long-term in that first year or so after they had done the intervention. We know that if you have very high levels of fear of recurrence, they are some of the things that can actually really help. I guess one of the challenges is that we still know that lots of people are really worried about accessing psychological support and care. That they would say, that when you suggest it, they might want to see a psychologist or a counsellor, that they’re not mad or they’re not crazy, so they don’t need that help. I guess one of the key messages that is really important for people to understand is that psychology is actually about strategies to help you cope a lot of the times. It’s to work out what skills you’ve already got in your toolkit and seeing what we can add to that, as well, that might help you cope with that better. 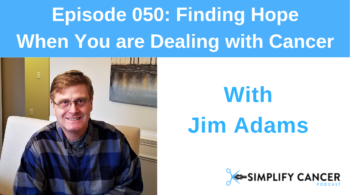 Often, we get people who are experiencing high levels of stress and distress, but they’re certainly not necessarily clinical diagnosed with either a psychiatric illness or something like that. Just when someone says to you, “Have a chat to the psychologist or the psycho-social team”, it’s really about the extra support and extra tools to help you in your day-to-day life. Joe: Cool. That makes so much sense, Haryana. What are some of your personal best tips for just having the life that you want after cancer? 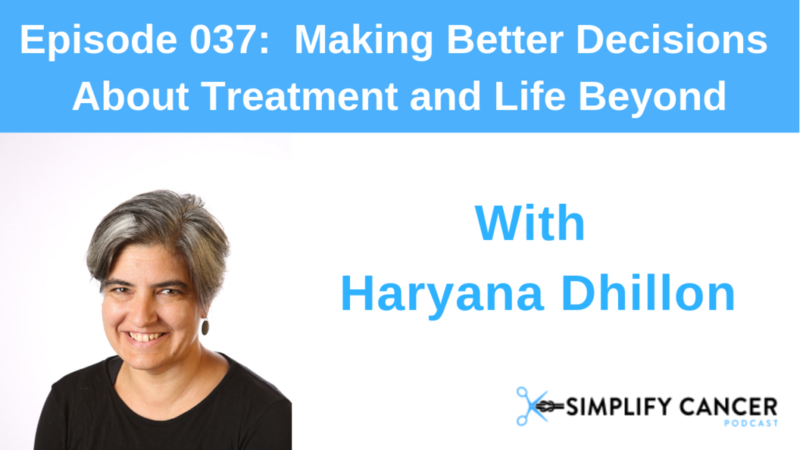 Haryana: I think it’s thinking about where you are now and where you’d like to go, the kinds of activity and function that you’d like to get back to. Actually, seeking out the support that you need to do that. We’ve already talked about the fact that you have your diagnosis and you go through your treatment. Then, hopefully, everything’s fine and you’re just having your follow-up, to make sure that the cancer hasn’t come back and monitor those sorts of things. Often, the treatments that you’ve had will have quite substantial impacts on your physical function and certainly your ability to get back to day-to-day life. People talk about this idea of the new normal as being adjusting to the changes, both physically and emotionally and mentally after a cancer diagnosis and treatment. I think the critical thing is that the new normal is something that takes a while to work out and it doesn’t mean that things are going to be the same as they are now. You might come out of your treatment, but you’ll actually change again with what other things are happening. Finding out, working out what’s the thing that’s most problematic for you at the moment and talking to people about where you can get help for that. For some people, it might be needing to get back on a better nutritional track. Some people when they’re going through treatment, will change their diet or they’ll find that they can’t eat properly, or they find that they can’t eat properly, or they’re not interested in food because of the changes or taste and things like that. Actually, working with the dietitian or a nutritionist might be quite helpful to do some of those things and get a good dietary intake and a healthy diet. For other people, it might be trying to get back to exercise. Joe: Yes, thank you, Haryana. That’s such great advice. Thanks so much for your time, Haryana. I really appreciate it. Haryana: No problem at all. Thank you. It’s been fun talking to you.